Are your hands always exposed to external elements when you go about your daily activities? Do you want them protected, but at the same time want to maintain dexterity and avoid bulky, heavy gloves? Nitrile is the material of choice in ensuring that the gloves you put on are protective yet thin enough for you to feel what you are handling, while at the same time are durable & safe. These are 6-millimeter thick Nitrile, made without latex and come powder free. Raven is ambidextrous in design, allowing you to slip it on either hand left or right, and constructed to be puncture and abrasion resistant. It is design for single use in activities ranging from plumbing, painting as well auto repairs, and is classified by the manufacturer as examination-suitable. The lack of a sizing chart means you risk an incorrect fit. Best stick to your normal average glove size in this instant. The cuff is also rather short for some, barely reaching the wrist area. While the packaging mentions these to be examination gloves, there is certification information provided. 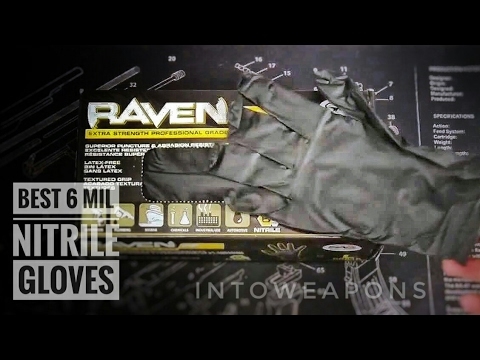 Raven Nitrile gloves have a fine texture on the fingertips, to assist when gripping objects as well as in handling tools. The fit is close and snug, bringing about comfort and dexterity. The cuff area is beaded, and this makes it easy for putting the gloves on or taking them off. Furthermore, this also makes sure that the pair you put on stays where it is supposed to be. This is suitable for sensitive skin being made without latex, and while the box does not offer information regarding the chemicals these are able to withstand, the manufacturer’s website has this guidance. The Raven is a good pair that provides barrier protection and great grip, suitable for numerous work tasks as well as regular household chores. The ambidextrous design makes if suitable for left and right-handers regardless of which hand you put it on.You can use Raven Nitrile gloves for sanitation, plumbing, health care, industrial and automotive. The Maxiflex Ultimates are multiple use Nitrile gloves, suitable for those with sensitive skin. It provides a barrier between your hands and the risks posed in the work environment, but at the same time allowing it to breath and function in comfort. 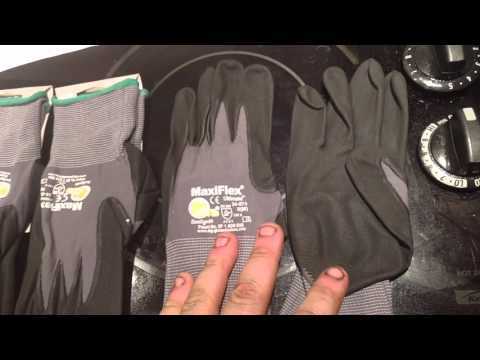 The Maxiflex Ultimate Nitrile gloves is constructed to be permeable – it is not waterproof. Furthermore, since it is rather thin in structure, it does not protect your hands from cold. Additionally, without a manufacturer’s sizing chart, you may have a hard time determining which size to choose from. Constructed from micro-foam Nitrile without any silicone used, these are designed without seams on the palms or finger area, thus ensuring a close and snug fit. Its smooth and rounded fingertips allow you superior tactile feel, making sure that you can handle delicate and minute objects. Maxifles Ultimate is coated with substance that makes work with lightweight oils possible, at the same time making sure that your grip remains intact. Other mentionable features include its abrasion resistance, as well as the knit material placement at the wrists. This makes the pair you put on tight and safely in place to shield your hands from unwanted elements in the work area and not get inside. Easily cleaned, these also remain smelling fresh for a lot longer. Before being packed and shipped out, the Maxiflex has been pre washed and therefore rest assured that you can use them as soon as you get hold of them. As you can use these more than once, it is indeed good value for money. Protective while simultaneously enabling close grip and tactile feel, these are suited for most environments be it outdoors or indoors. 6-millimeter thick and with dual-layer protection, the Venom Steel Nitrile gloves are said to be suited for heavy-duty use, particularly for auto repairs or when cleaning using harsh chemical substances. It comes in 4 sizes, including one that is deemed to fit most people, should you be unsure of your size. 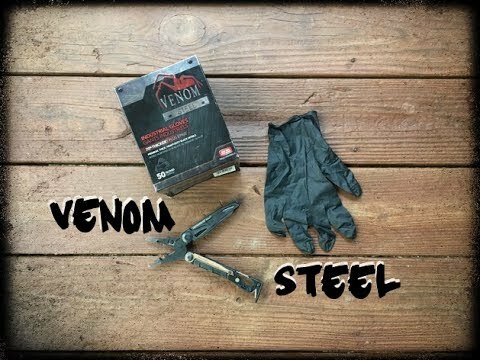 Venom Steel have been mentioned to rip rather easily although touted to be for heavy duty, industrial use. Also, do pay close attention to the sizing in selecting an appropriate fit, as this will ensure better comfort and dexterity. Specifically useful, is the dual layer protection where black and white coloured sheets allow you to identify if there has been a puncture or tear in the pair you have on. You will therefore not knowingly be in contact with risky substances while working. These two layers are also resistant to rip, tear and puncture, and these come in 9-inch cuff length for better safeguarding against splashes. The manufacturers have also helpfully provided a chart for you to checkout the chemical substances the Venom Steel is resistant to. When compared to standard medical gloves these come fully textured, thus allowing great grip and dexterity, especially for handling lightweight tools and small objects. Sensitive skinned users can be assured that these will not irritate them, as there is no latex used in its making, as well as it comes without powder. These are good for the times you require the protection from tear and rip, when working with harsh chemicals. The dual-layer would definitely assist in determining if your hands are still protected, as you are able to tell if a pair has been compromised. If you work in a chemical laden environment and require protection for your hands, the Ammex is for you. It comes with a chemical suitability guideline, taking you through what it can do for you in preventing permeability risks. With a thickness of 6-millimeters around the palm and fingers, these black Nitrile gloves are much suited for heavy-duty use. It comes in 4 sizes. Some find these too thin than other heavy-duty gloves in the same category, and that it tears rather easily, even upon first usage. The Ammex Nitrile gloves is great in providing information for potential buyers. It provides a detailed measurement and especially useful is that these have a longer cuff, thus offering protection from splashes. The material used in making those, namely the Nitrile, is superior that either vinyl, latex or chloroprene in terms of elasticity and for resisting puncture and abrasion. It is for industrial use, and its durability means that you do not need to change your gloves as often in a day. These also maintain dexterity, enable the handling of small items while protecting you against chemicals and grime in your workplace. In terms of design, these are geared for better grip, even in wet conditions with raised textures around the finger and palm area. Being free of latex and without powder, sensitive-skinned users will find these non irritable. Superiorly designed, the Ammex is highly protective, especially against chemicals, while at the same time, maintaining your finger and hand movement. These may be used more than once, and is even does not irritate The skin. Constructed using a non-foaming formula, with a pair of these on your hands, you will work with the peace of mind that your grip remains intact even in wet conditions. Comes in a distinctive black colour to contrast against the work background, the Microflex MidKnight MK-296 meet United States Food and Drug Administration (US FDA) medical examination as well as food handling requirements. Sizing needs a little extra care as these do not come with a measurement chart. The packaging does not offer information on the exact thickness of these – thus making it harder to accurately select these to suit your desired work function. The cuff area is also slightly loose, not able to prevent unwanted material from entering. These are suitable for a wide range of activities – from repairs, to handling food, even extending to use for medical examinations. Plus points for its variable use! The black, which is the only colour it comes in, allows you to hide stains a lot better while providing a contrast to the background you are working against. The Microflex also offers High tensile strength and dexterity, complying with the relevant American Society for Testing and Materials (ASTM) and European standards. It contains no natural rubber latex and is powder free, therefore suited to those with sensitive skin. The close fit and snugness ensures that you have firm and consistent grip, be it large or small objects, dry or otherwise. A flexible glove from a trusted manufacturer, these are well suited to almost anyone, in a wide range of industries. Those with latex allergic will find no fault with a pair of these, as it is not made with latex nor comes with powder.All those features make them the best Nitrile gloves for food preparation. You can never miss these Astro Grip gloves – highly visible, coloured in a safety-orange shade, these show that you mean business! Suited for use in a good range of activities – from auto repair jobs to plumbing and painting, these are strong and durable. It is also made without latex and is powder-free. Unfortunately these have a foul chemical odour about them, making it uncomfortable when used in close proximity to the face. It is not stated on the packaging whether these are of food grade or if it is not. Furthermore, without a sizing chart made available by the manufacturer, it is rather hard to get the size right for first time buyers. These are constructed with thickness of 7-millimeters, which is slightly higher than other similar products. While made highly durable, its packaging states that it is especially purposed for single usage, although multiple uses are possible for some. Its main feature is the dual-textured surface, namely on the back of the hands as well as in the finger and palm areas. This is what lends its name – Astro-Grip, because of the superiority it offers with regard to this. The structure of Astro grip allows good finger feel and dexterity, which is not compromised even when handling oils, paint or common industry-related substances. Compared to other typical Nitrile gloves, these are considered to be far more tear resistant plus last longer. It has is reasonably better puncture and chemical resistant. Unmissable in orange, these are thicker than other similar types; with a great grip feature thus its name, Astro Grip. These are great for those with sensitive skin as it is powder and latex free, and a pair of these on your hands allows you to work with peace of mind. These come in bright, attractive cobalt blue, distinguishable to other usually pale blue-coloured hospital gloves. Made for medical use, latex and powder free, these non-sterile, disposable Nitrile gloves resist tear and are reasonably tough and durable. It is also designed to suit left and right-handers, as it is designed to be ambidextrous. 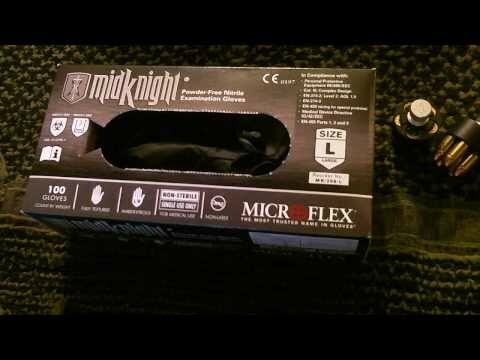 The Microflex Cobalt N19 did not state the material thickness on its packaging, nor in the manufacturer’s description. Although it is said to be of medical grade, nowhere is it stated whether is compliant with the United States Food and Drug Agency (US FDA) guidelines. Sizing can also be a hit or miss, as there is no size chart or measurement guidance provided. Composed of Nitrile, expect these to be durable and tear resistant. The material it is constructed from further means that these will not have the pungent smell of latex, while at the same time more snug and of better fit than vinyl-made gloves. The textured finish around the finger area allows good handling of small objects and strong grip in various conditions, wet or dry. Additionally, made to be suitable for sensitive skin, these are reasonably protective enough to be used with a number of chemicals, whether in a work environment or while doing household chores. The bright colour makes a difference, where the cheery cobalt blue ensures that you will not miss these when it is laying around. Tear resistant, tough and durable, your pair will guard your hands in a number of activities, while also making sure that you have a good grip and feel of the objects being handled. The Infi-Touch gloves are made of latex, with the added combination of Nitrile for extra strength and protection. It is powder-free, durable and flexibly designed to be ambidextrous. These are non-sterile and to a degree, are puncture, tear and abrasion resistant. In addition, it is suitable for use when handling certain chemicals, as it is highly resistant to such substances. The manufacturer does not list the thickness of these gloves on the packaging – you need to only rely on estimates or around 6 millimetres as per other users’ description. Also, there is no sizing chart, and therefore you have to refer to what you normally would wear for gloves in size selecting selection. The Infi-Touch has high tensile strength and provides good protection as it is made to protect your hands when dealing with oil, harsh cleaning materials as well as salon hair dyes, for example. The black Nitrile it is composed of ensures that these are strong enough to resist puncture to some extent, while at the same time maintaining good tactile feel. The fingertip area is textured, therefore even when wet, rest assured that you can still handle those small fiddly objects with ease and confidence. It is also possible for these to be used more than once, as it is durable enough for this purpose. It also has a smooth interior finish, therefore putting the Infi-Touch on and taking it off is less cumbersome than other similar products. Protective, strong and durable, these are suitable for varied and multiple use. Especially resistant with some chemicals either in dry or wet environments, these provide good barrier protection while maintaining tactile feel and dexterity for those hard to reach places and in handling small objects. Made by a medical supply company, the Dealmed complies with the guidelines of the United States Food and Drug Agency (US FDA) and are graded and approved for handling medical equipment and examinations. It comes in 4 sizes, and since it is designed with an ambidextrous fit – regardless whether you are right or left handed, you will wear these in comfort. It is latex and powder-free, making it suitable to those non-resistant to rubber proteins. It is rather disappointing that the quality control for the gloves is rather slacking – some pairs tear too easily and are inconsistent in size and durability. There is also no sizing chart provided, and getting the size right is somewhat hard. Contained in a user-friendly dispenser box, these are 3.5 millimetres in thickness, providing barrier protection in dry and wet conditions, with a degree of resistance to tears and cuts, as well as certain chemicals. The textured design in the fingertips makes handling small objects easy, and the close fit allows good tactile feel. The elasticity and fit is snug in design, securing the gloves in place during its use, even for lengthy periods. The added elastics also allows for easy on and off for these. In addition to its suitability for sterile hospital environments, these are also approved for food preparation. Furthermore, the Dealmed is flexible enough not only for indoor use but for the outdoors, specifically when finger and hand dexterity is sought for. The Dealmed are US FDA approved for medical use and food management. Its ambidextrous design makes it a good choice, catering to both the right and left-handed. Being latex-free as well as powder-free, these qualities ensure that those with sensitive skin can utilise them. The Adenna is 100% latex free and is deemed suitable for a range of activities, from working in an auto workshop, to marine environments, plumbing and manufacturing as well as painting. It only comes in black for the purpose of masking stains. Unfortunately these are not sterile and are suited to single use only. The gauntlet is rather too short, and buyers need to beware that its thickness is inconsistent throughout, namely, 9 millimetres at the fingertips but only 6 millimetres on the palm area. Quality control is also an issue, where a box of gloves will have several pairs that tear much too easily. Also nowhere does it state that these are powder free. Rest assured that should this happen, you can request for a replacement as these are guaranteed to be free from material and workmanship defects beginning from the date of delivery and up to a one-year period. As the manufacturers provided a sizing chart, it is easier to determine the correct size for your hands. The average 9-millimetre thickness of these makes it abrasion and tear resistant up to a degree. It is designed with a textured finish and therefore enables good grip, whether you are using it in dry or wet conditions. As it is non permeable to an extent it is also suited for use with chemical substances. 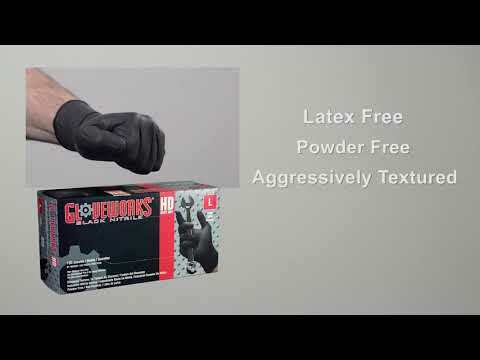 A good pair of gloves, 100% free from latex and therefore suitable for those allergic to latex protein. These are thick and are abrasion and chemical resistant, but bear in mind, is still not tear proof. The 9-millimetre thickness is just an average, and not the overall measurement for the gloves. As you can see from the reviews above – there is definitely a Nitrile gloves pair that is suitable for whatever you intend to do – be it in dry or wet conditions, in an auto workshop or for food handling or medical examinations. 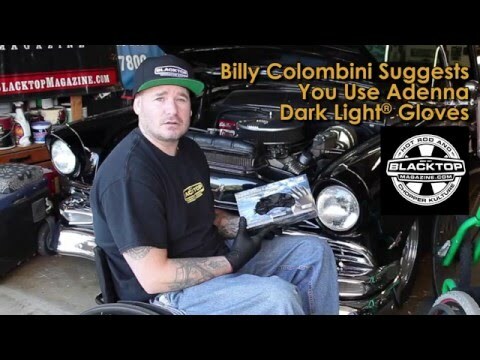 It is hoped that this listing was of some help to you, and that your hands are protected and safe.If you still need help continue reading our buyer’s guide below. Nitrile has been the material of choice for a number of reasons. Most common amongst these is its ability to resist chemicals. In the web of Nitrile products out there, here is a guide that we hope will assist you in choosing the right work gloves pair. We do not intend for it to be the mother of all guides, but for you to roughly get an idea of what you should consider when looking out for Nitrile ones. We will go about this by what you intend to do with them, the thickness of the material and the additional design offered by the manufacturers for your needs. What you are going to do with it? This is fairly straight forward, but nevertheless of utmost importance. While there are a good number of different products out there, do pay attention when you are to choose gloves particularly for handling food. In such instance, look for the United States Food and Drugs Administration (US FDA) guideline compliance to be on the safe side. This is to avoid handling food using gloves that may contain chemicals that are transferable to the consumable items you are handling. These chemicals may not be suitable for ingestion and may even be toxic. For medical examinations, US FDA also has guidelines, and the packaging should inform you of this. Medical use also requires that the pair be sterile – and most manufacturers will make sure that this information is visible to you before purchase. Nitrile gloves are more resistant to chemicals than other glove types. However, you need to know which chemicals your hands will come into contact with. A good manufacturer should have a list to guide you in choosing a pair that resists permeability and thus ensure adequate protection. Longer cuffs are also to be considered to protect your arms from unwanted splashes. If you are dealing with sharp objects, gloves made out of Nitrile do provide resistance to punctures and tears. However, these are definitely not entirely tear proof nor are they designed to withstand extreme abrasion. Safety work gloves are more suited to dangerous tasks, therefore bear this in mind. The thickness of the material used will affect your finger dexterity as well as sensitivity to what it is you are handling. Commonly in 6-milimetres in thickness, ones that are of thicker material than this offers more protection, but as a trade off, will provide less of a tactile feel. If enhancing grip is important in what you do, look for ribbed or raised textures around the finger, fingertips and palm area, as these give a firmer hold on objects, even when wet. Nitrile gloves seldom come breathable due to its construction and material used, therefore, do pay attention to how long you will be in them, as it might get sweaty, slippery and uncomfortable. Colour options are also available – you need not choose black ones unless your work environment requires it to be. Orange and cobalt blue ones are also available, and these do stand out, if this is your preference. Should you be sensitive to rubber proteins, non-latex options are widely available. 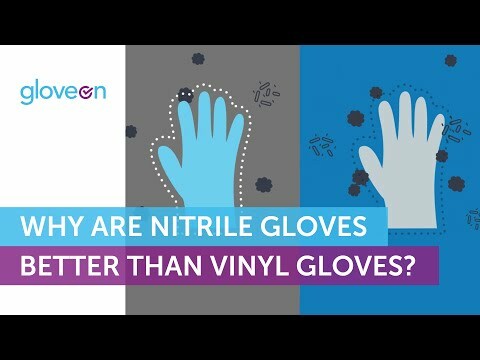 Furthermore, you can also choose powder free ones that are non irritable.Nitrile gloves still better than Latex gloves & Vinyl ones and the video below explain it well. Sure you know that Nitrile gloves should fit you, but nevertheless, we will still underline that getting a right fit is important. Your hands will be easily fatigued in a tight pair, and you will lose dexterity. A large pair compromises your grip and folds present will prevent a firm hold on objects. Therefore, do consult the manufacturers sizing charts for this purpose. Some may not offer measurements, and in this case go for your normal average. It may be confusing as there are a lot in the market for a somewhat similar product. We hope that you will get a good fit, as well as be more productive in what you do once you select the perfect pair. Hope this guide has helped you do that!